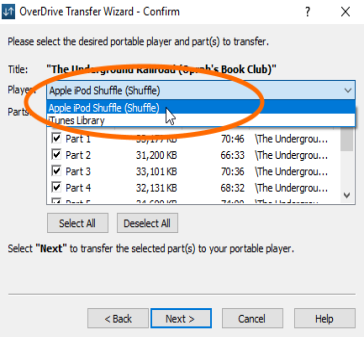 You can transfer audiobooks from your computer to your iPod using OverDrive for Windows (desktop). If you're using Windows 8 or newer, you can begin the transfer process from OverDrive for Windows 8/10 instead of the traditional desktop version. If you're using a non-Apple MP3 player (like a SanDisk or Sony device), use these instructions instead. Note: We always recommend using the latest versions of iTunes and the OverDrive desktop app. In iTunes, turn on the Manually manage music setting (or enable disk use if you're using an iPod shuffle). 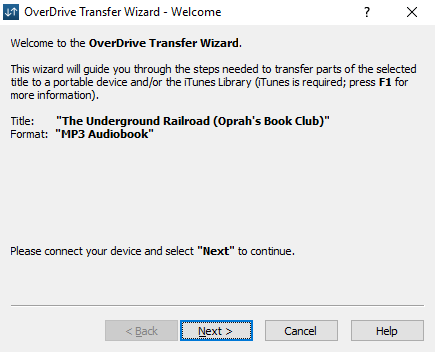 This is a one-time step that is required to transfer audiobooks to your iPod from OverDrive for Windows (desktop). Note: You may get an error (such as "No portable players could be found...") if you don't turn on "Manually manage music" or enable disk use before transferring. 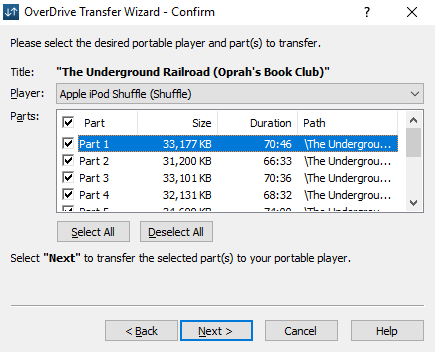 Select an audiobook, then click Transfer. When the transfer wizard opens, click Next. Select your device under "Player." Be sure to choose the Apple device (name of your device) option (not "Apple USB Driver," "ROOT directory...," etc.). Select the part(s) you want to transfer and click Next. By default, transferred audiobooks are listed under Music > Albums. You can change where transferred audiobooks appear on your device by following these instructions. No portable players could be found. Please make sure your portable player or cable is properly inserted into the appropriate slot of this computer.